Mizerka - thanoscardgamess jimdo page! This popular Polish game is a three-player game using a standard 52 card pack, the cards in each suit ranking as usual from ace (high) down to two (low). 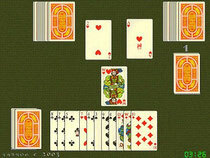 The dealer deals six cards to the players. Then, the deal pauses and the player to dealer's left chooses among six possible contracts (most tricks with/without trumps or to avoid tricks). After the contract has been announced, the deal is completed, so that each player has a hand of 13 cards and there are left 13 cards in the deck. The declarer may now discard any number of unwanted cards and replace them by drawing cards from the top of the deck. Each player must choose each contract once, and after 18 deals, when everyone has played every contract the game ends. You may select between three decks.